An amazingly healthful food utilized for over 5,000 years, sesame may be one of the most potent, nutrient-dense medicinal foods still used today. Sesame seeds are not only praised for their nutritional content in seed form, but are also highly valued for their rancid-resistant oil. In fact, once you learn of the health benefits of sesame seeds, you may just find yourself stocking up on this ancient condiment. As mentioned, sesame seeds have a fabulous nutritional profile, granting their capabilities in fighting, preventing, and reversing illness and disease. The seeds are especially high in copper, manganese, calcium, and magnesium. But the value doesn’t end there. Here are some notable vitamins, minerals, and other nutrients you can expect to find in a 1 ounce (28g) serving of sesame seeds. Manganese – 0.7 mg. 35% RDA. Copper – 0.7 mg. 35% RDA. Calcium – 277 mg. 28% RDA. Iron – 4.1 mg. 23% RDA. Magnesium – 99.7 mg. 25% RDA. Zinc – 2 mg. 13% RDA. Fiber – 3.9 g. 16% RDA. Thiamin – 0.2 mg. 15% RDA. Vitamin B6 – 0.2 mg. 11% RDA. Phosphorous – 179 mg. 18% RDA. Needless to say, the above nutrients, and others, help to make up the numerous health benefits of sesame seeds that have been experienced for thousands of years. It’s time to discover what exactly the Egyptians and other cultures around the world saw in these tiny seeds. Here are over 12 sesame seeds health benefits. Promote Healthy, Beautiful Skin – Sesame seeds are full of zinc, an essential mineral for producing collagen and giving skin more elasticity. Zinc also helps damaged tissues in the body to repair. Sesame oil is also known to sooth burns and prevent skin related disorders. Great for High-Protein Vegetarian Diet – Sesame seeds offer 4.7 grams of protein per ounce, giving them a perfect place in a high-protein vegetarian diet. Sesame Seed Oil for Oral Health – One of the most prominent benefits of sesame seeds and sesame oil revolves around removing dental plaque and boosting oral health. By engaging in an activity known as oil pulling, which involves swishing oil around in your mouth, you can boost oral health and even whiten your teeth. One study showcases the oil pulling benefits on the oral level, where oil pulling with sesame oil was shown to reduce the amount of streptococcus mutants in both teeth plaque and mouth saliva, and boost overall health. (Click the next link to find out what oil pulling is and learn of oil pulling benefits). Helps Prevent Diabetes – Thanks to magnesium and other nutrients, sesame seeds, and especially sesame oil, has been shown to combat diabetes. One study, published in 2011 in the American Journal of Clinical Nutrition, found that sesame oil “improved the effectiveness of the oral antidiabetic drug glibenclamide in type 2 diabetic patients”. Another study concluded that “substitution of sesame oil as the sole edible oil has an additive effect in further lowering BP and plasma glucose in hypertensive diabetics”. Reduces Blood Pressure – As the above study concludes, sesame oil has been shown to lower blood pressure in hypertensive diabetics. Additionally, magnesium has been shown to help lower blood pressure – and sesame seeds are loaded with magnesium. Promotes Heart Health – Further adding to the health benefits of sesame seeds, sesame seed oil can boost heart health by preventing atherosclerotic lesions. An antioxidant and anti-inflammatory compound known as sesamol, which also harnesses anti-atherogenic properties, is thought to be one reason for the beneficial effects. According to GreenMedInfo, sesamol has been shown to “possess over two dozen beneficial pharmacologically active properties, many of which may contribute to improving cardiovascular health”. Protects Against DNA Damage from Radiation – Sesamol, a compound found in sesame seeds and sesame oil, has been shown in some studies to protect against DNA damaged caused by radiation. Further, sesamol has been shown to extend life in mice treated with radiation, partly by preventing damage to the intestines and the spleen. Prevents Cancer – Not only do sesame seeds contain an anti-cancer compound called phytate, but the magnesium in sesame seeds also harness anti-cancer properties. One study published in the American Journal of Clinical Nutrition found that the risk of colorectal tumors decreased by 13% and the risk of colorectal cancer decreased by 12% for every 100 mg of magnesium taken in. Boosts Bone Health – In addition to promoting healthy skin, zinc has also been shown to boost bone mineral density and bone health as a whole. One study, published in the American Journal of Clinical Nutrition, found a correlation between zinc deficiency and osteoporosis in the hip and spine area. What’s more, sesame seeds are a great source of calcium – a known trace mineral that is essential for bone health and preventing related conditions. Boosting Digestive Health, Relieving Constipation – Sesame seeds are rich in fiber, which is known to pave way for a healthy digestive system and a healthy colon. Provides Relief from Rheumatoid Arthritis – A mineral that is important for anti-inflammatory and antioxidant enzyme systems, copper is known for reducing pain and swelling associated with arthritis. Additionally, this mineral helps provide strength to blood vessels, bones, and joints. Promotes Respiratory Health, Prevents Asthma – Thanks to the magnesium, sesame seeds are able to prevent asthma by and other respiratory disorders by preventing airway spasms. Does it help with low white cell blood count? Is the oil as nutritious? How about pure sesame oil to cook with, as in let’s say, Rangoon’s. Do you still receive the same healthy benefits? They forgot too mention about sesame seeds boosts IBS. It’s number 3 on the list of causing allergy in humans. It was a great article though, I can talk rubbish as well, like my mate said about 5000 years ago he made the first wheel. He then found drinking a black oil found in the ground extended his life! Sesame oil has incredible health properties irregardless of this article. The health properties are clearly evident by watching the 2015 Tokyo Japan travel channel episode BF: Delicious Destinations. The finest restaurants use sesame oil for their Tempura dishes which would explain the clear healthy flawless skin of Japanese in Japan. in what form to eat sesame seeds and what r the results? what kind of sesame oil ? like a cooking oil, or special supplemental oil sold in a health food store ? In what form are you using sesame seeds? Ingesting seeds? Topically applying sesame seed oil? What would I look for and where? You can sprinkle them on your salad or pasta. Thank you so much for this useful and informative article about the sesame oil for hair. I am having a dandruff scalp which results in a itchy flaky scalp.So I want to know if the use of sesame oil can reduce the problem of my dandruff ? Please tell me as i wish to have a dandruff free scalp. Hi I am sure the sesame oil would help, but for myself, I would use coconut oil on scalp and in hair because it smells nicer. Either way . One evening warm the oil and massage it into your scalp, put on a shower cap and let it work for an hour, the massage more with fingertips. I can leave it on my head and it will be absorbed, but you may want to wash it out in a day with mild shampoo or just warm water. I read that oil pulling with untoasted, unrefined sesame oil can naturally reverse TMJ disorder. Please compare the nutrient values of minerals in sesame seeds before & after they are hulled. There's a significant difference, especially for calcium which is mostly unavailable in the hulls where the phytate binds much of the calcium & other minerals. That's why sesame seeds are traditionally hulled, but there are at least two hulling processes, both of which affect the nutritional value of the hulled seeds. It's complex & deserving of your further attention, please. Remember, also, please, the omega-6 to omega-3 ratio which is so high that sesame would be best combined with another seed with a more opposite ratio, for example, chia. Thank you. 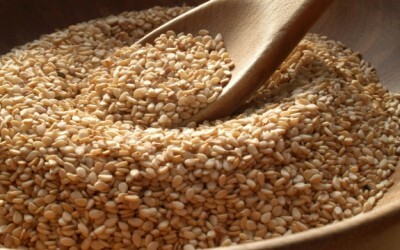 Great Article on Sesame Seeds and Oil. Great benefits to human's health. I like to know the benefits of other grains and vegetables.